Notes: Perhaps the most famous class of vessel in Starfleet history, the Constitution class was a legend in its own time. When launched, the USS Constitution set a new standard of excellence in almost every applicable field - she was simultaneously the fastest ship, most advanced exploration platform and most powerful combat vessel in known space. The four hundred and thirty crew enjoyed a standard of crew accommodation unknown on other vessels of the period, while the diplomatic facilities rivalled those of all but the most elaborate Starbases. 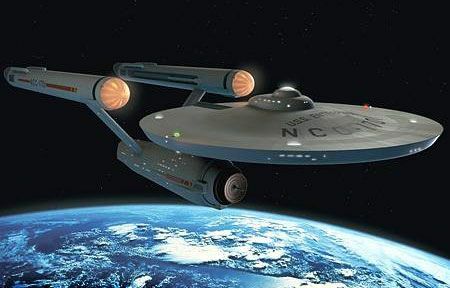 Quickly following the Constellation in 2245 was the USS Enterprise, NCC-1701. This was to become the most famous vessel in Federation history; during her years of service life the Enterprise explored countless new worlds, making first contact with many species and expanding the Federations knowledge of the territories surrounding it hugely. Like her sisters the Enterprise also served as a mighty deterrent to both the Klingons and Romulans, several times taking part in combat actions which determined the fate of the entire Federation if not the Alpha Quadrant itself. The Constitution class ships where designed for long duration missions with minimal outside support, and exploratory missions typically lasted up to five years. The Enterprise conducted several such missions, first under Captain April and then under Captain Pike, followed by Captain Kirk. Kirk captained the Enterprise through her most difficult missions, and it is largely because of his incredible success that the Constitution class has acquired the reputation it has. Other ships of the class were less fortunate than the Enterprise; the USS Defiant was lost in an interphase pocket in 2268.7 The ship emerged in the Mirror universe, where it was captured first by the Tholians and then by the Terran Empire. The USS Excalibur and lexington were badly damaged in the unfortunate M-5 incident - Excalibur's entire crew was killed in the incident. Virtually the entire crew of the Exeter was killed by a deadly alien virus in 2268.22 The USS Constellation was destroyed fighting against the Doomsday machine, again with the loss of her entire crew. By 2265 the early Constitutions where reaching twenty years of age, their designed life span. Starfleet had decided that they where becoming somewhat long in the tooth and was looking for a replacement class; however, such was the popularity of these ships that the Starfleet design bureau stated in an official memo that none of the contemplated new designs matched up to them and the best course of action was to simply rebuild the existing ships with the latest technology. Although Starfleet was not convinced at first, careful testing of the skeleton framework of several Constitution class ships revealed that the basic structure was more than capable of continuing in service, having withstood twenty years of hard use with ease. After arriving in 2379 the Enterprise was converted to the new warp scale. Captain Scott, who oversaw the initial refit back in 2269 along with his younger double from a different quantum reality were able to use the upgrades the Kelvins did to the ship to allow the Enterprise greater speeds. The Enterprise also had a cloaking device installed in 2379 that could switch between a traditional cloak and being a phase cloak. It was also converted into a training ship.